Love this BILLYBANDIT Boys Blue Velvet Suit for Fall Winter 2017-18. 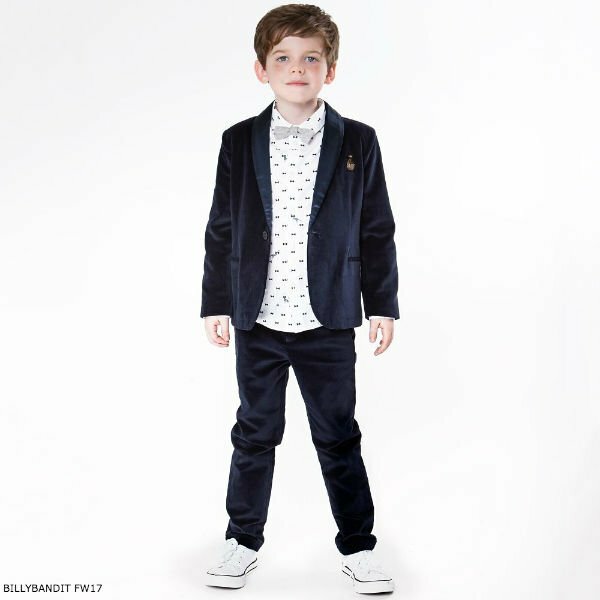 Perfect for any special occasion, French brand Billybandit puts fun in to formal wear with this super cool velvet jacket. Typical of Billybandit's off-beat humor, he'll love the gold embroidered bug and satin lapels. Complete the look with a BILLYBANDIT Boys Shirt with Bow Tie and matching BILLYBANDIT Boys Blue Velvet Pants. Dress up the look with leather dress shoes or dress down with a pair of high-tops.